Successful industrialist, former President of FICCI, Deepak Banker (77 ) is an enigmatic personality in Chennai business and social circles. 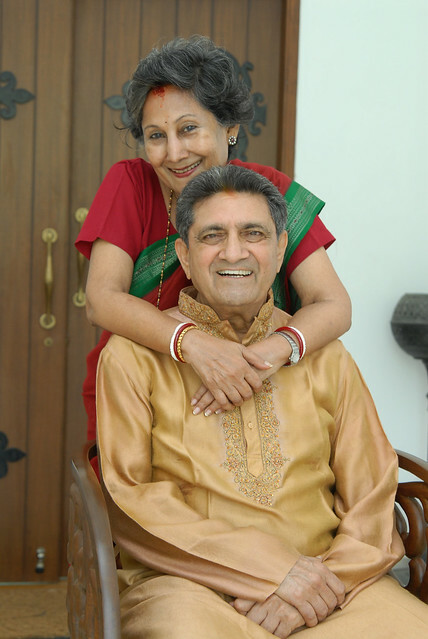 His wife Gita Banker (72), soft spoken, striking and suave is the perfect partner for this handsome man and together they have etched a perfect niche in life among family, friends and colleagues. Sitting in their spacious, tastefully appointed beach house on the East coast road in Chennai, we enjoyed talking to them over a delicious and authentic Gujarati meal – Panchkuti dal, Sambhariyu nu shaak, piping hot pooris and steamed rice. When asked about their family they proudly tell us that they have two daughters, a son, a daughter-in-law, a son-in-law and two beautiful grand-daughters. Jigyasa and Pratibha: Tell us how you met? He: I used to live in Mumbai and Gita had come there for her summer vacation. We met through family friends, and I think we liked each other instantly. We met a few more times and decided that we would like to tie the knot. I would call ours an introductory love marriage. She: (Laughs heartily) We were engaged and married within a span of 5-6 months. That was December 1961. J&P: Wow! So you have just celebrated your golden anniversary! What was it that attracted each of you to the other? She: Frankly, I found him more open minded than the conservative Ahmedabadi Gujaratis of my time. And of course we shared a good chemistry…he is handsome after all, isn’t he? He: The first thing that attracted me were her eyes…such an innocent face she had…please put that word innocent in inverted commas (winks)! She was well educated, cultured and from a family that was very much in tune with the times and the world. As a matter of fact, she continued to study after marriage and completed her masters in English Literature. J&P: Together you have made a beautiful family. What are your views on marriage and togetherness? She: Marriage is certainly not a bed of roses all the time. There have been times when give and take really made all the difference. A quote I read somewhere says – “There never was a cloud that the sun’s rays have not pierced. ” There is a solution to every problem if one is strong enough to persist. A relationship of love and marriage has to be based on faith, trust, and tolerance. He: It is nice to know that youngsters have the freedom of choosing their own partners these days. But divorce rates are at an alarming rise. Our old tradition of arranged marriages resulted in a more committed and everlasting togetherness between couples. But times have changed and we cannot continue putting restrictions on youngsters. I believe that in many arranged marriages these days, the situation gets aggravated because the young couple have no concept of what a married life is when facing the new world in front of them. She: It requires grit and determination to forge ahead to build a long lasting relationship. So if you want it, you will work at it. He: Evolutionary social change is happening in our country, and we really need to ask ourselves if our commitments are in place. Nowadays live-in relationships are catching on in urban India. I don’t see any reason for living together and yet not committing oneself. It shows you are unsure of yourself. The foundation for a strong marriage is respect for each other. Without respect you cannot communicate, and without communication you cannot balance life. I do understand that marriage in today’s world is a difficult proposition. Both partners are working nowadays, often in different cities and only meet over weekends. How then does one foster commitment and a sense of family? J&P: So tell us, do you have many disagreements? He: Oh plenty! We are always disagreeing; some tangible disagreements and some imaginary. But we’ve been married for 50 years, so obviously we get over them! She: We agree to disagree and respect each other’s opinions. If there are no arguments and disagreements, then it would be very fake and boring! We enjoy our fireworks (laughs aloud as she pats his shoulder). She: So, we just let love take over – right! On a serious note, never go to bed with resolving your fights. J&P: One change you would like to see in each other? He: I’d like her to be less rigid in her thoughts and become more flexible. She: I wish he would argue less! But after 50 yrs of togetherness, we have a peaceful life. We give each other less chances for confrontation. He: (playing along with her light hearted banter) Oh yes! We meet for breakfast, lunch and tea for a span of half hour each time at most. We have dinner in our own separate rooms now. But what we enjoy doing together is listening to old Hindi songs and meeting our many wonderful friends. J&P: On a serious note, what is your advice on love and commitment to the younger generation? He: Very simple! Definitely try to have independence within the home. Give each other space and let the children be the main ingredient around everything else, while pursuing your own independent careers. She: I agree whole heartedly. Family bonding is the key factor. He: No matter how much of the best of food you eat out, you eventually want to have a bite of your home food. You can cook all kinds of cuisines at home. So really speaking home food gives more variety and yet allows you to cook as per your taste buds! She: There is no doubt that home cooked food is wholesome and nutritious! I do like to eat out for a change and I also do admit that home food does get boring sometimes. He: I am a no fuss eater. I always prefer my Ahmedabad food! I have 30 precious recipes of my mother tucked away! She: I sometimes use her recipes and also my own mother’s. But I must confess that I don’t enjoy cooking. Fortunately we have cooks who are well trained now to cook our style of food. He: She may not like to cook, but she is a good cook! Whenever our cook takes a holiday, she cooks excellent rotlis, dal…subzi. She: No! I’m a hopeless cook! He: Let me be a judge of that (and a fresh argument ensues). J&P: Do you think a way to a man’s heart is through the stomach? She: If you have a foodie for a husband then yes! He: Food acts as a catalyst. She: I don’t think food is important! She: Thank God, times have changed (rolls her eyes)! J&P: (By now we are adept at nipping the next argument) Give us a favourite recipe! She: I think Deepak would love to share one of his mother’s recipes (she says tenderly). First published in May 2012 in Harmony – Celebrate Age Magazine for the column – Soul Food and Soul Mates. Part-2 of this post is the healthy Gujarati recipe of Methi bhaji ane Kela nu Shaak from the kitchen of Deepak Banker & Gita – the 11th couple featured in this column.